Niagara Falls, America’s first state park, is an enduring legacy of the visionaries who worked to save it for future generations. 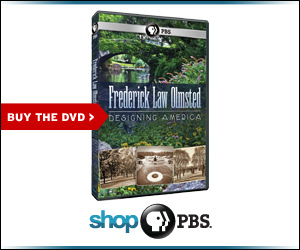 Frederick Law Olmsted is rightly remembered as the most accomplished landscape architect in U.S. history; the designer of great municipal parks and other landscapes. He was also a key figure in the nation’s most significant early examples of scenic preservation. These endeavors were not mutually exclusive, and in fact park design and scenic preservation were both aspects of the practice of landscape architecture Olmsted developed in the second half of the nineteenth century. Public parks of all types – from municipal pleasure grounds to state and national reservations – made it possible for the general public, not just a wealthy few, to experience a wide range of landscape scenery. Olmsted believed such experiences were vital to the health and well-being of individuals, and therefore of society as a whole. If Central Park provided beautiful and picturesque scenes for New Yorkers, Niagara Falls and Yosemite Valley gave visiting tourists a different scale of sublime landscape experience. In the first case, extensive grading, planting and other improvements were required to transform the Central Park site into a dramatic sequence of landscapes. At Yosemite and Niagara, the challenge for the landscape architect was to protect existing features from the damage that visitors could do, and to choreograph the sequence and pace of their experience in the design of roads, paths and other facilities. 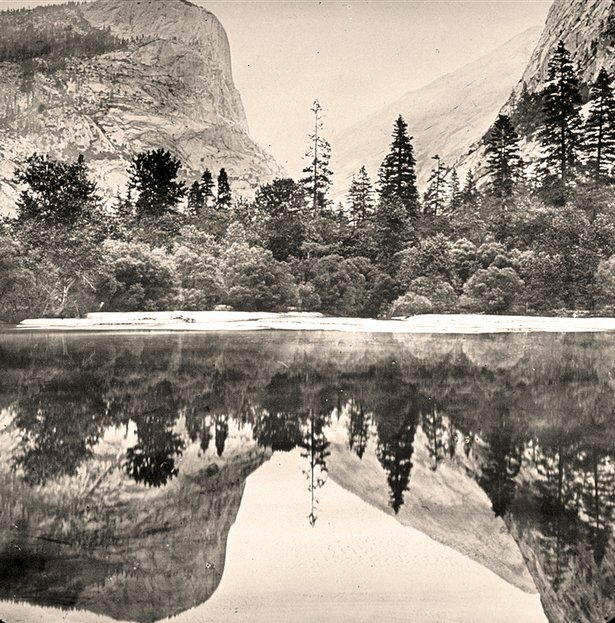 Reflections in Mirror Lake, Yosemite Valley, California.Library of Congress Olmsted described these intentions for preserving an existing scenic landscape as a public park in the Yosemite Valley report he prepared while Central Park was still under construction. In 1864, Olmsted was living in Bear Valley, California, when Congress passed the Yosemite Grant that ceded the nearby Yosemite Valley and Mariposa Grove of giant sequoias to the State of California for public park purposes. Olmsted had no hand in the legislation, but the governor appointed him to head the commission charged with managing the new park. The report Olmsted wrote in 1865 outlined a program of minimal, unobtrusive development (including paths, overlooks, carriage roads and camping facilities) that would allow what he foresaw would eventually be millions of visitors to the valley to have a full experience of it, while keeping the landscape as undeveloped and undisturbed as possible. 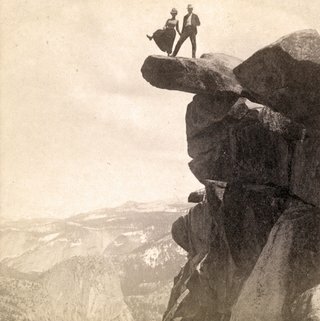 Glacier Point, Yosemite Valley, California.Library of Congress The Olmsted children on a camping trip in Yosemite.American University Library Olmsted went much further in his report (as he often did in his park reports), providing the fundamental intellectual framework for federal park making. He noted that it was “the main duty of government” to protect and provide the means for the “pursuit of happiness.” That pursuit, for Olmsted, depended on preserving places such as Yosemite Valley and creating public access to them. “It is a scientific fact,” he asserted, “that the occasional contemplation of natural scenes of an impressive character, particularly if this contemplation occurs in connection with relief from ordinary cares, change of air and change of habits, is favorable to the health and vigor of men… beyond any other conditions that can be offered them.” Government had nothing less than a duty to assure that “enjoyment of the choicest natural scenes in the country and the means of recreation associated with them” be “laid open to the use of the body of the people,” because if government did not act, those places would be monopolized by the few and experienced only by the elite. “The establishment by government of great public grounds for the free enjoyment of the people” therefore was justified – in fact was required – of a republican form of government that derived its authority from its people, not an aristocracy. 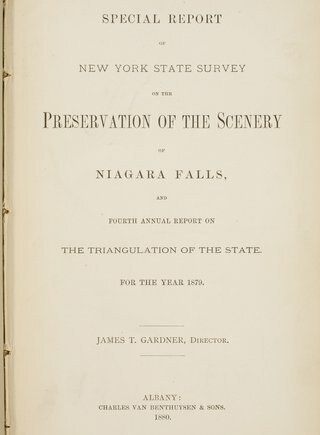 New York State Survey on the Preservation of Scenery of Niagara Falls.American Antiquarian Society Olmsted returned East in 1865, and while his Yosemite report was not made the basis for state management of Yosemite Valley, he was soon involved in another landmark scenic preservation project. Olmsted advocated for the preservation of Niagara Falls beginning in at least the late 1860s, when he was at work designing the municipal park system of nearby Buffalo. Hotels and tourist attractions had grown up around Niagara for decades, forcing tourists to pay to gain access to overlooks and creating what many considered an inappropriate setting for the awesome spectacle. In 1879 the New York Legislature appointed Olmsted, along with the Director of the New York State Survey, James T. Gardner, to prepare a special report on conditions at the falls. 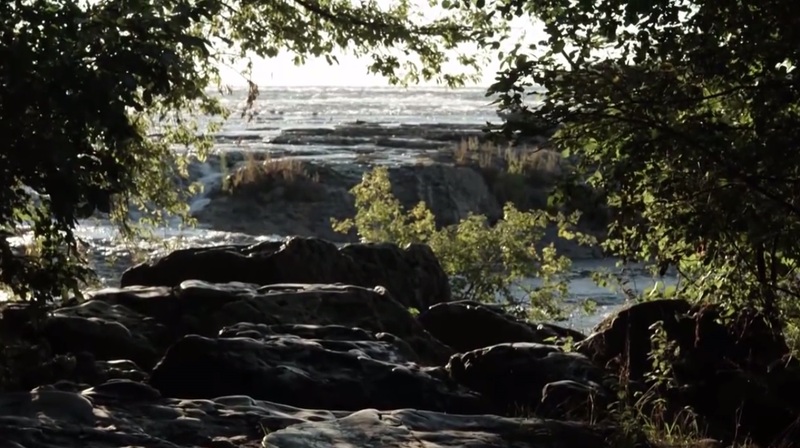 Their report emphasized the need to preserve the surrounding landscape, especially Goat Island, which separated the American and Canadian falls, and the shoreline along the rapids above the falls, which was lined with buildings. The report also contained a petition, which Olmsted and his friend, the Harvard art historian Charles Eliot Norton, had drawn up and circulated. 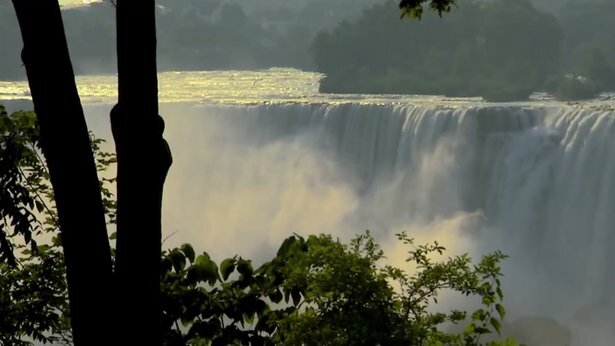 Signed by leading cultural and political figures in the United States, Canada, and Great Britain, the document urged the state to acquire the private property around the falls and provide for a better form of public access. Olmsted worked with a number of colleagues, especially Norton, to orchestrate a campaign to influence public opinion, a first of its type in the cause of scenic preservation in the U.S. The two men hired journalists Henry Norman and Jonathan B. Harrison to write articles on conditions at Niagara and on the legislation proposed to remedy them. Their efforts received a boost following the 1882 election of a supporter, Grover Cleveland (then the mayor of Buffalo), as governor of New York State. Olmsted and Norton helped found the Niagara Falls Association early in 1883, a group that intensified the effort to persuade the state legislature to act. 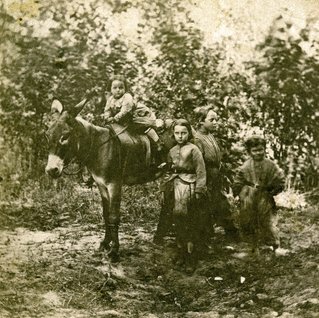 Later that year the legislature approved a bill to establish the Niagara Reservation, and Cleveland signed it. In 1885, the same body finally appropriated funds to establish the reservation, and it became the first park of its type to be created by a state government. In 1886 Olmsted finally had the opportunity to design the state reservation around Niagara Falls, working in collaboration with his old partner, the architect Calvert Vaux. Olmsted had been far more involved than Vaux in planning and advocacy for Niagara, but he acknowledged that Vaux had an important role in the design work, which they completed in early 1887. The Niagara report demonstrated how landscape architecture could be used to preserve and to restore a scenic landscape through the acquisition of private property, the removal of previous development, and the facilitation of public access through the construction of park drives, paths, overlooks and limited visitor amenities.Through the development of the area as a park, more destructive forms of resort development were avoided and the public had opportunities for more meaningful experiences of a place that otherwise might be dominated by commercial enterprises. View of the rapids from the Niagara Reservation. Scenic preservation was not ancillary to Olmsted’s practice of landscape architecture, but integral to the theory as well as the techniques of landscape design that he developed. Today we tend to think of these two processes almost as opposites; that is, we think of landscape design as changing and adapting landscapes to new or altered purposes, and of preservation as preventing change and maintaining existing uses and character. But in fact Olmsted’s approach to landscape design involved a lot of preservation, while the preservation of Niagara, for example, required extensive new design. Public parks of all types also shared a basic purpose for Olmsted: assuring that varied and profound experiences of landscape beauty, from the pastoral expanses of his city parks to the most dramatic landscape features of the continent, would be accessible to everyone. The common thread was the benefit to individuals and to society that could only be achieved through the creation of a full range of accessible parks and reservations, assuring a more healthful and functional civilization. Learn more about Olmsted and scenic preservation at Niagara Falls watch Frederick Law Olmsted: Preserving Western New York. FLO, “Preliminary Report on the Yosemite and Big Tree Grove,” 1865 (Papers of FLO 5: 488-516). FLO, “Notes by Mr. Olmsted,” in Special Report of New York State Survey on the Preservation of the Scenery of Niagara Falls for the Year 1879 [c. March 22, 1880] (Papers of FLO 7: 474-81). See Papers of FLO SS1: 46-53. FLO and Calvert Vaux, “General Plan for the Improvement of the Niagara Reservation,” 1887 (Papers of FLO SS1: 535-75). Alfred Runte, Yosemite: The Embattled Wilderness (Lincoln, NE: University of Nebraska Press, 1990), 38-39; 49-54. See FLO to Richard W. Gilder, July 10, 1889 (Papers of FLO, Library of Congress). Robert U. Johnson to FLO, June 23, 1889 (Papers of FLO, Library of Congress). FLO and Jonathan B. Harrison, Observations on the Treatment of Public Plantations, More Especially Relating to the Use of the Axe,  reprinted in Landscape Architecture 3, no. 4 (July 1913): 145-52. FLO to Robert U. Johnson, Oct. 9, 1889 (Papers of FLO, Library of Congress). FLO, Governmental Preservation of Natural Scenery, March 8, 1890 (Papers of FLO, Library of Congress). Ethan Carr is an associate professor of landscape architecture at the University of Massachusetts, Amherst. He is a landscape historian and preservationist specializing in public landscapes, particularly municipal and national park planning and design. He has written Wilderness by Design and Mission 66: Modernism and the National Park Dilemma that describe the twentieth-century history of planning and design in the U.S. national park system.